Pushing conventions, breaking communication barriers and bridging connectivity – these are the building blocks of leading mobile technology enabler, MACROKIOSK. 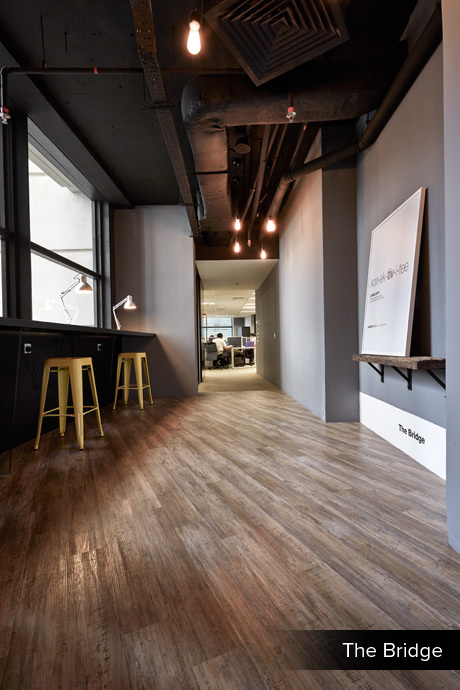 These core elements may just as easily describe their new Kuala Lumpur workspace, which is fondly referred to as The Space and accommodates a 170-strong team - and counting - since 2014. Housed on the entire third floor of Tower B at The Troika KLCC, a multiple award-winning development by world-renowned architecture firm Foster + Partners, The Space appears to possess the innate design language very much similar to the building in which it resides – a part coincidental and part deliberate measure that bodes well for the entire look and feel of The Space. The Space is built upon the five elements that governs the business model of MACROKIOSK – functional, engaging, collaborative, creative and innovative – where the essence of powering connectivity is interwoven into its design approach. 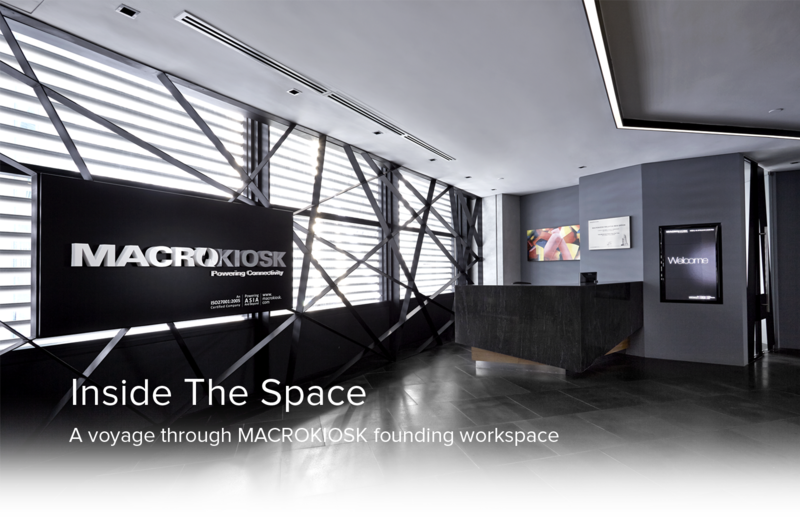 Spearheaded by MACROKIOSK's internal workspace design team in collaboration with a local interior design and built company, The Space is a continuity of a branding exercise to streamline the workspace design concept of each and every one of MACROKIOSK's 13 offices. 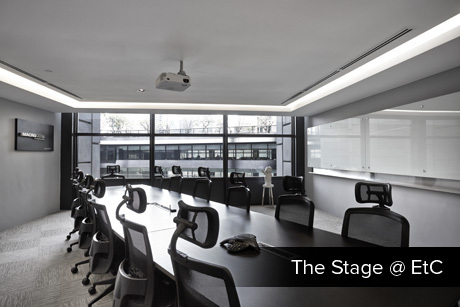 To get a full grasp of the entire workspace, one must first have a basic understanding of the building's design itself. The Troika KLCC comprises a twisting geometry of three towers that combine residential, offices and retail within a single development. The unique structural system that supports stacked blocks offers an optimized view of the surrounding city skyline, whereas a verdant central courtyard lies in the belly of the development. 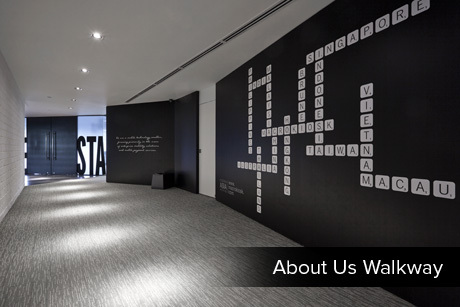 The atypical structure results in an unconventional horseshoe or U-shaped layout that highlights the span of MACROKIOSK's 18,000 square feet workspace, which is filled with uncommon room shapes and awkward corners that are cleverly transformed into functional spaces. Thanks to the circular design of the building, there is something different to refresh the visual palate at every turn and corner. 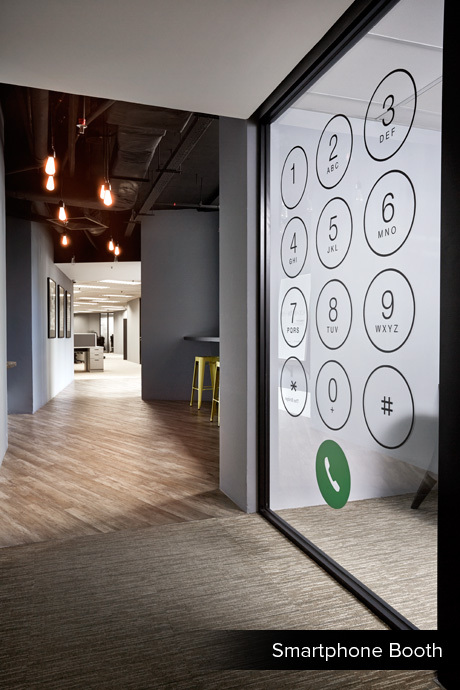 The building's facade bears a distinct characteristic and decidedly monochromatic palette that are seamlessly integrated into The Space, the latter which is coincidentally similar to MACROKIOSK's official theme color of gray, black and white. This striking triptych lends a stylish and high-tech look and feel to The Space, while highlighting MACROKIOSK's commitment in technological investment and a corporate culture that centres on transparency. Upon exiting from the elevators, one steps directly into The Space's private lobby and is greeted by a massive web of steel sculpture – meticulously handcrafted and installed by a local sculptor – that becomes a backdrop to the company's signage. 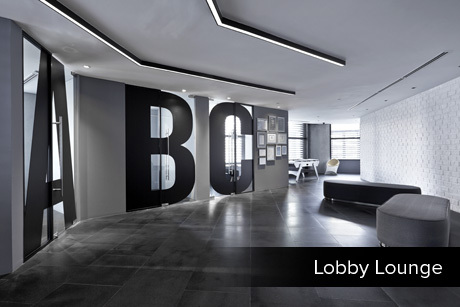 The private lobby marks the beginning of a series of common areas identified as EtC, which stands for Engagement & Collaboration that also comprises a reception lounge and three enclosed breakout spaces named “A”, “B” and “C”. The pathway leading towards other parts of the EtC are flanked by walls that depict the identity of MACROKIOSK as a trailblazer and indicate its strong presence in 13 countries / regions. 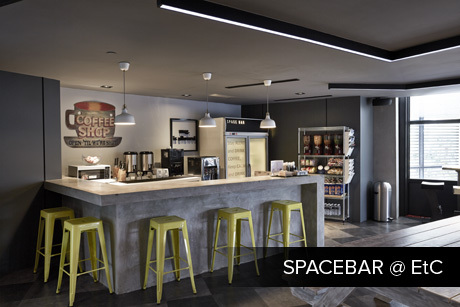 One arrives next at the SPACEBAR, an ingenious name taken after the horizontal bar on a keyboard, which is essentially a fully-functional bar that provides all-day free food and beverages with a selection of breakfast and afternoon tea served daily. Situated at the opposite end of the SPACEBAR is The Garage, a tongue-in-cheek reference to the stereotypical beginnings of many successful IT companies. 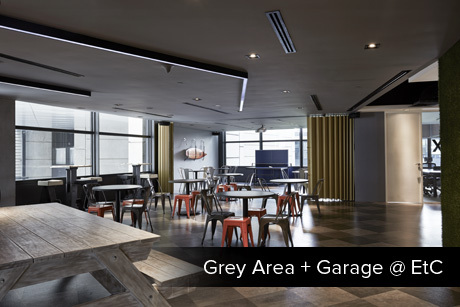 Equipped with custom-made steel gates and audio visual facilities, The Garage is generally used for training and doubles as an extended space from the Grey Area for having meals or working. Occasionally, The Garage is used to host engagements such as movie nights. 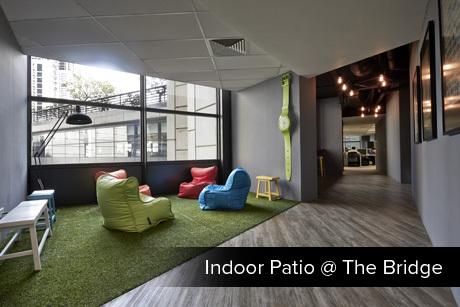 Here at The Garage, one is given a first glimpse into the lush central courtyard that grants a different ambiance depending on the time of the day. Through the large glass windows, one is also offered a vantage point of The Space right up to the far end of the circular layout which indicates the 192-metre mark from the main entrance. EtC extends to three additional enclosed breakout spaces “X”, “Y” and “Z” followed by the The Stage, the single largest enclosed space where anyone who uses it is required to perform. These functional spaces are linked by an open space named AREA 31 that caters to town hall meetings, parties and launches. Beyond this point is where the official workspaces begin. 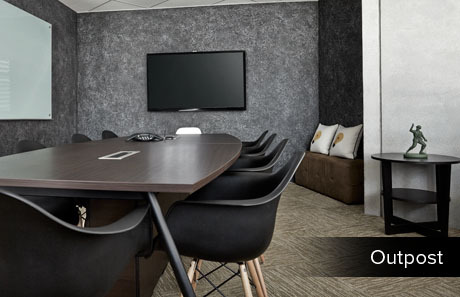 Individual workstations are meticulously planned around an open spatial layout occupied by 120-degree work desks for optimized comfort and efficiency. Each of the 10 rooms for the management is uniquely angled and no two spaces are symmetrical in the entire workspace. 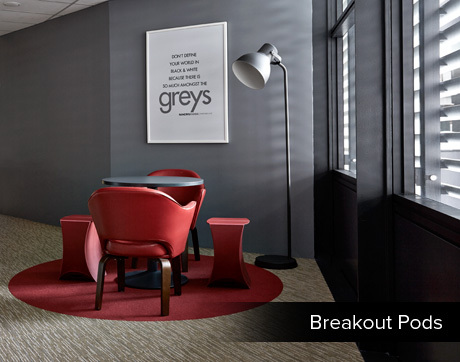 Breakout pods that are segregated with brightly coloured carpets and seats are planned around the space as open meeting areas. 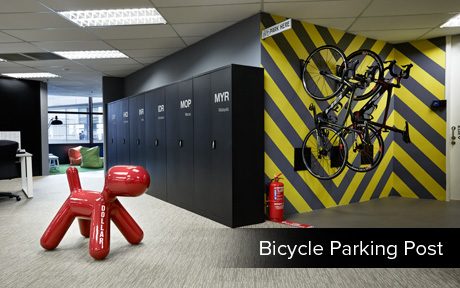 Also available is a dedicated bicycle parking post, which makes cycling to work a viable option for the cycling enthusiast. Tucked into a corner are two purpose-built rooms, Outpost and The Den. 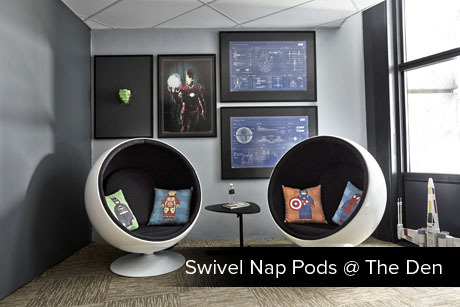 The former serves as a video and teleconferencing room in the likes of a military command post and the latter is designed as a cozy enclave for quiet repose, brainstorming or even catching a power nap in one of the swivel nap pods. Moving along The Space, one would pass through The Bridge, which offers plenty of breakout spaces including a patio illuminated by ample natural lighting and comes with artificial grass, ledges with high stools and even a bespoke MACROKIOSK version of a phone booth for making and receiving phone calls in privacy. The novelty of The Bridge is complemented with a solitary piece of wood, which once belonged to an old bridge in an indigenous village, along with numerous object d'arts that feature as focal points on the walls. Across The Bridge are more workspaces, breakout pods and a chair-less enclosed breakout space for quick huddles. Reflecting MACROKIOSK's propensity for embracing efficiency and sustainability in its business practices, every area in The Space's layout is positioned to leverage on the expansive glass windows for natural lighting to enhance visibility while reducing energy consumption. In addition, the workspace uses zero-VOC paints, flooring made of recycled materials, low voltage lighting and an air-conditioning system that runs on chilled water. MACROKIOSK's investment into The Space's IT infrastructure is ahead of the curve with CAT6 network cabling at its core alongside redundant power and bandwidth supplies. 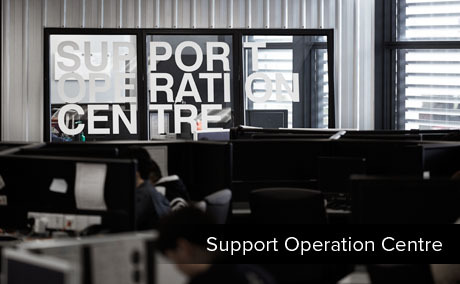 The Space also houses a 24/7 support operation centre and an off-site data centre aptly named “TEXT LAB” in addition to MACROKIOSK’s main data centre located in Cyberjaya. Upon reaching this point, one would have walked 192 meters from the entrance, as indicated on the wall. From here, one can either visually indulge in the tranquil ambiance of the courtyard, or trek 192 meters back to where you started and have your journey around The Space come full circle. There are job openings across all our offices. Find out more here.